Tonight was the official press launch of 'The Collection of Tompkins and Bush: Michael Jackson Wardrobe'. The exhibition - which will run at the Westfield Shopping Centre in Stratford, London, until early next month - features an array of iconic outfits from all of Jackson's world tours as well as his music videos and other public appearances. 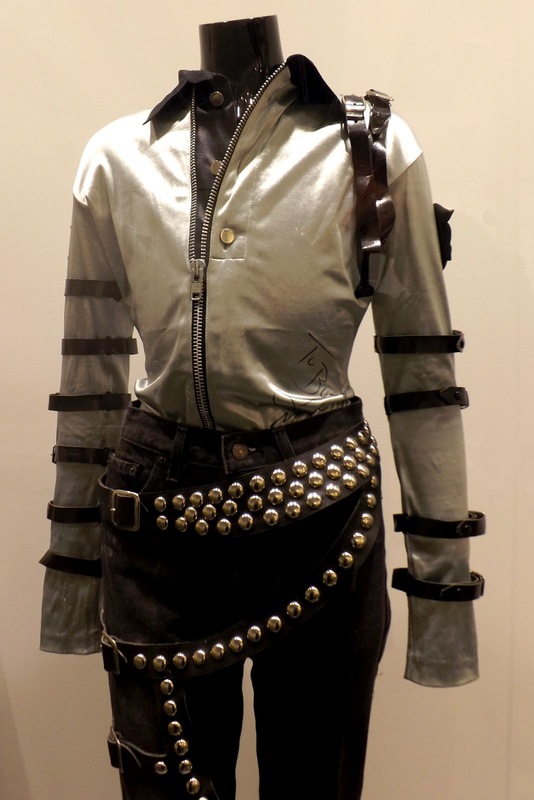 Each of the costumes on display was designed by Michael Jackson's costume designers of 25 years - Dennis Tompkins and Michael Bush. This evening I had the great honour of being the first journalist in Britain to be taken on a tour of the exhibition. My tour guide? Michael Bush. The press launch officially began at 5.30 this evening, but I met Mr Bush outside at 5pm, where I chatted to him for about 15 minutes while we waited for the lights inside the gallery to be switched on. When everything was up and running we continued our interview inside as he led me around his favourite exhibits. The exhibition, which coincides with the imminent publication of Mr Bush's book 'The King of Style: Dressing Michael Jackson', is definitely an exercise in quality over quantity. The space isn't enormous, but it is teeming with historic designs. You will see the suit Michael Jackson wore for the Smooth Criminal short film. The outfit he wore in the Scream music video. The patented shoes he invented with Bush and Tompkins so he could lean forward 45 degrees live on-stage. The outfit he wore during his 1993 Superbowl performance. The costume he used to open his Bad World Tour. And a whole lot more. 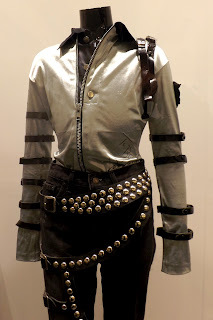 Michael Jackson's Bad Tour costume. Click to enlarge. Photo property of Charles Thomson. The collection is not complete. Some items displayed at previous incarnations of the exhibition are nowhere to be seen in London. They include Jackson's gold costume from the HIStory World Tour, the suit he wore in 2002 for his last ever live performance in front of an audience and the jacket he wore in his Leave Me Alone music video. Also missing are various signed sketches demonstrating Jackson's involvement in the design process. This could be because the collection has been split. According to the tour schedule, it opens in Tokyo before it closes in London - so it follows that the missing items are probably on their way to Japan. That said, I've been told that some items will be switched over on October 14th to change things up, so perhaps these missing items will manifest themselves then. After Tokyo, the collection will go on display in Los Angeles. Then, across three days in November and December, the items will be auctioned off. A portion of the proceeds will be donated to charity. Mr Bush explained to me his decision to sell off the items in our interview, which will be published next week. 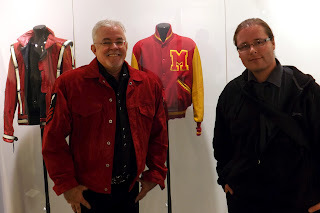 Our discussion ranged from how certain costumes were conceived and created to why Michael Jackson took such a long break from touring between 1997 and 2009. Mr Bush also spoke to me about his work on This Is It in the months before Jackson passed away and, at one point, became choked up as he explained how the death of his partner Dennis Tompkins last December reaffirmed his decision to write the book and take the costumes around the world. As soon as the interview is published, I will post it here. Charles Thomson and Michael Bush pose in front of two of Michael Jackson's Bad Tour jackets. Click to enlarge. Photo property of Charles Thomson.